Maureen’s interest in yoga was first cultivated during her time in India, where she spent three weeks living at a yoga ashram in Rishikesh. 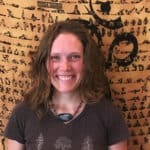 She has since settled back in Blacksburg, VA and has dedicated herself to the study of yoga and self-inquiry with Anna Pittman, completing her 500 Hour Yoga Teacher Training certification, as well as Level I and II of her Transparency Coaching Program. In her time studying and teaching yoga, Maureen has come to learn the transformative power of yoga to purify the body, calm the nervous system and delve into the bigger questions of our existence. In her classes, Maureen combines creative somatic inquiry, refined alignment cues, and techniques to encourage a sense of deep relaxation—offering these tools to students so they may clean their windows and let the light shine in. Maureen is a certified massage therapist specializing in Myofascial Release and Deep Tissue massage.